Home › Mallard › Indian Spot-billed duck - Anas poecilorhyncha. The Indian Spot-billed duck (Anas poecilorhyncha) is a dabbling duck belonging to the family Anatidae. The Indian Spot-billed duck species are distributed in Asia, Indian Subcontinent, Myanmar, China and Southeast Asian countries. 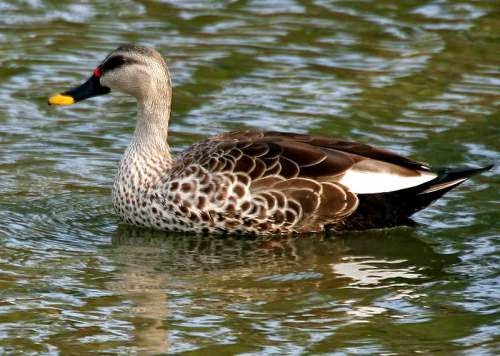 The two recognized subspecies are A. p. poecilorhyncha (Indian Spot-billed Duck) Forster, 1781 and A. p. haringtoni (Burmese Spot-billed Duck) (Oates, 1907). Anas poecilorhyncha is now considered as a separate species from A. zonorhyncha. It is also considered closely related to A. superciliosa and A. luzonica. The male spot-billed ducks are larger than the females, measuring 60 to 65 cm in length and weighing 1,200 to 1,500 grams. The females weigh 800 to 1,350 grams. Their wingspan is 80 to 90 cm. It has a scaly patterned body with a green speculum and a band of white tertials. The body is brown-grey. The females are more brown with duller patterns. The dark bill is tipped yellow. The male duck has an orange red patch at the base of the bill. These spot-billed duck species inhabit both inland and coastal wetlands such as ponds, lakes, pools, streams, creeks, estuaries, tidal flats and marshes. They mostly feed on grasses and other vegetations. Sometimes they may feed on insects. The breeding season varies according to the local rainy season. The birds in Northern India breed during July to October and those in South India breed during November and December. The nest is built near water and is concealed in vegetation. Eight to twelve eggs may be seen in the nest. The subspecies A. p. poecilorhyncha is distributed in the Indian Subcontinent, including Pakistan, Nepal and Bangladesh. The subspecies A. p. haringtoni is distributed in Assam State in India, Myanmar, China and Vietnam. These spot-billed duck species are mostly sedentary and they may migrate locally for water sources and feeding grounds. These duck population is large and is widespread. The combined population of both the subspecies is estimated to be 150,000-1,100,000 individuals. There is pressure of hunting, habitat degradation and hybridization with other closely related species. The IUCN (International Union for Conservation of Nature) has categorized and evaluated these spot-billed duck species and has listed them as of "Least Concern". Current topic in Birds of India: Spot-billed duck - Anas poecilorhyncha.